Hello and happy Thursday! 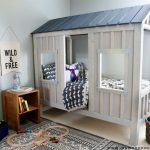 You guys have been asking and I’m happy to finally share how I stained, painted, and finished my son’s DIY cabin bed! 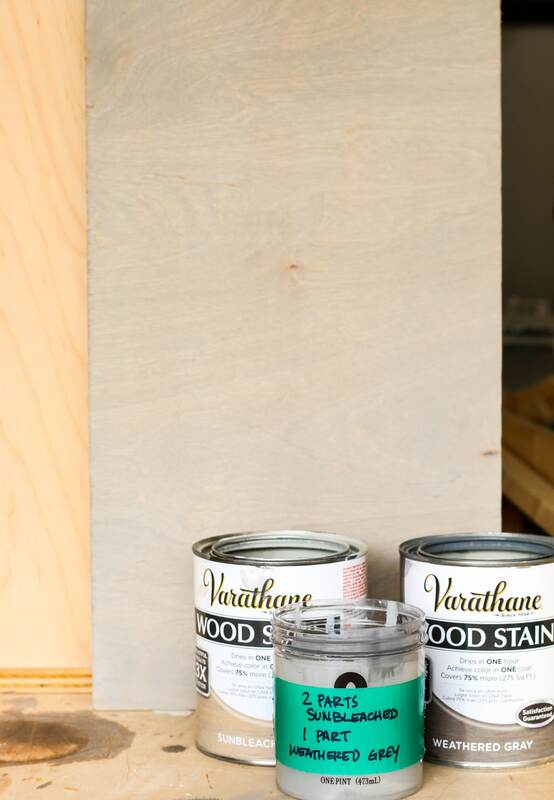 I teamed up with the friendly folks at Rust-Oleum to bring you this finishing tutorial. Are you ready? Let’s do this! This is the little cabin bed that could! 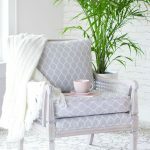 It’s been getting a lot of attention lately – it’s been featured on POPSugar and it even won Best Kids’ Project on BobVila.com (yes, THE Bob Vila!). I’m still pinching myself over it. 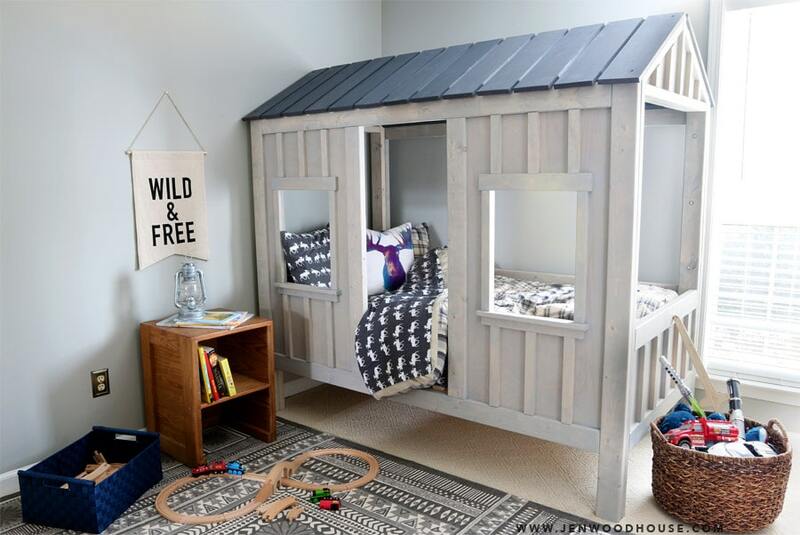 We just love this little cabin bed. It makes bedtime pretty magical. 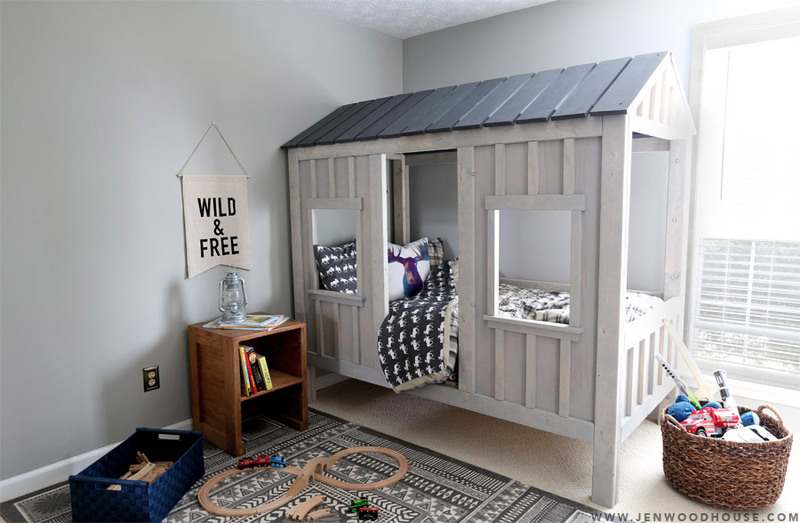 If you’d like to learn how to build this DIY cabin bed, here is the step-by-step tutorial (complete with free building plans and a video). Okay – so let’s get on with the finishing tutorial. 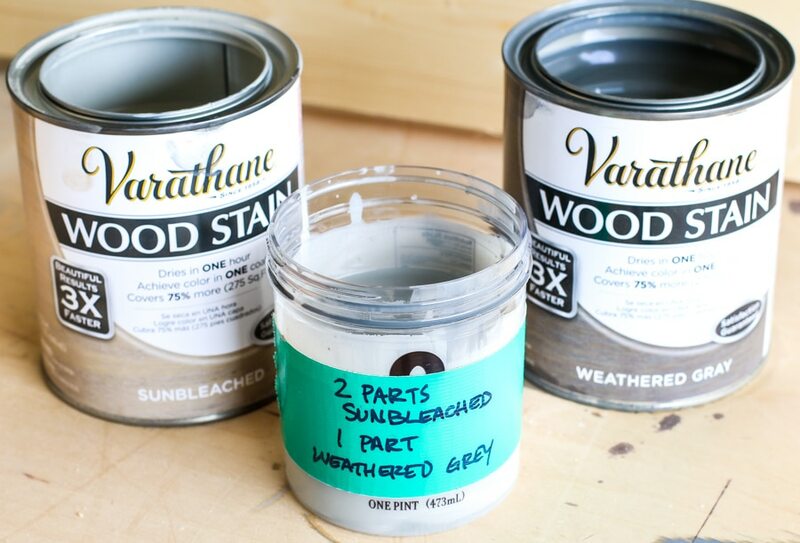 Two of my favorite stains are Varathane’s Sunbleached and Weathered Gray Wood Stain. For this project, Sunbleached was much too light and Weathered Gray was much too dark, so I mixed the two to get the best of both worlds. I poured the Sunbleached stain into a plastic container (an empty gelato pint – don’t judge) then little by little, added Weathered Gray until I achieved the depth and darkness I wanted. I kept testing it out on scrap wood along the way – the formula ended up being about 2 parts Sunbleached to 1 part Weathered Gray. First, I sanded the entire bed with 150-grit sandpaper, then moved up to 220-grit. Then I used a wet/dry shop vac to remove all the dust and debris. 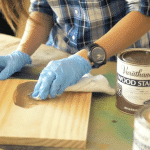 Next, I dipped a clean, lint-free cloth into the custom stain mixture and rubbed it onto the wood, allowing the stain to penetrate the wood completely. Instead of letting the stain sit and soak for awhile, I prefer to rub it all in, so that all of the stain is absorbed into the wood. 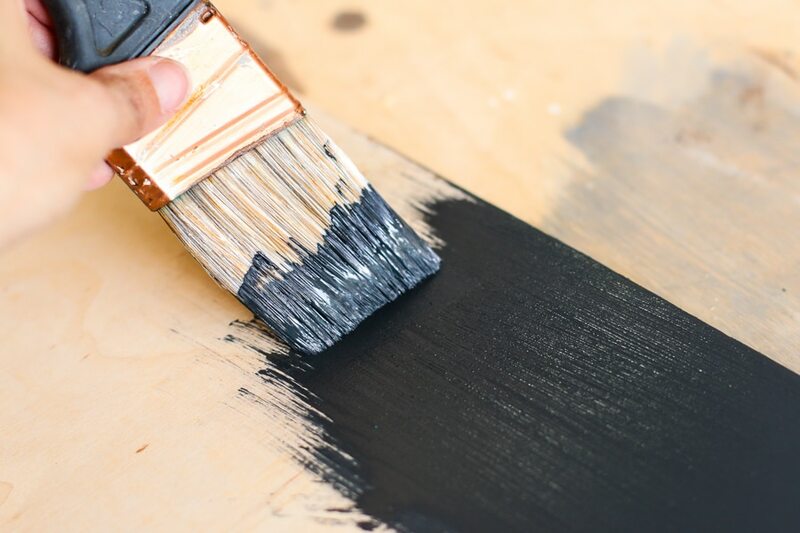 I don’t like surprises when it comes to staining, so I’d rather see what the color looks like right away and add more layers if I want to deepen the color. I applied two coats of my custom stain. 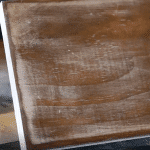 Here’s a comparison to the stained wood to a piece of unfinished wood. I like that the color is a bit deeper than if I’d used Sunbleached alone, yet not quite as dark as if I’d only used Weathered Gray. It’s a nice, happy medium. Then I moved onto the roof slats. 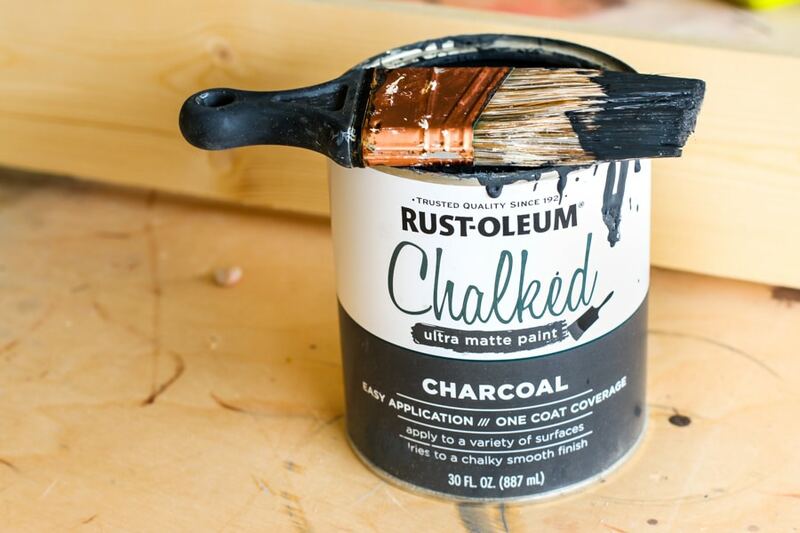 Using an angled brush, I brushed on Rust-Oleum’s Chalked paint in the color Charcoal. 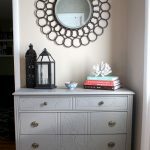 I love their new Chalked paint line! It goes on so easily and the coverage is amazing. Look at all the pretty colors it comes in too! I only needed one coat of this stuff. Love that! After allowing the whole cabin bed to cure for about a week, I applied 3 coats of Varathane’s Polyurethane with a high quality brush, sanding with 320-grit sandpaper in between each coat. 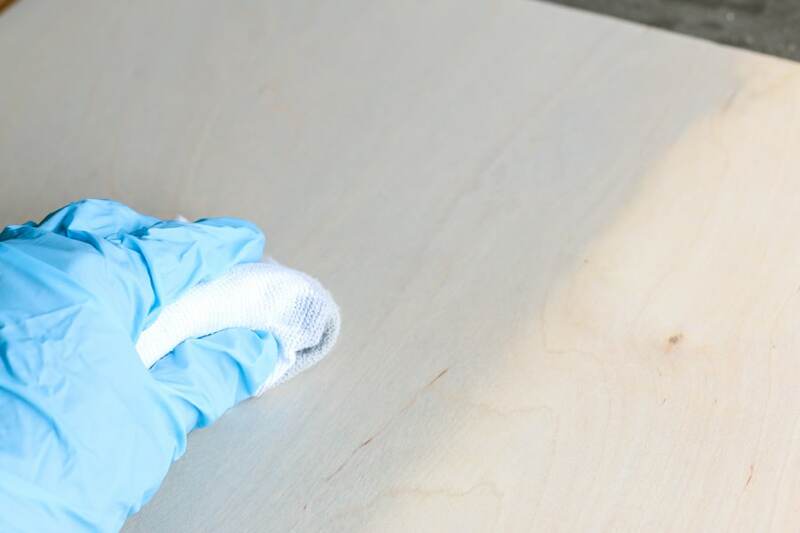 While you typically shouldn’t mix oil- and water-based formulas, as long as you allow the oil-based stain to cure (at least 3-4 days), you can apply a water-based poly over an oil-based stain. I chose to use the water-based formula because an oil-based polyurethane can yellow over time, whereas a water-based finish stays clear. 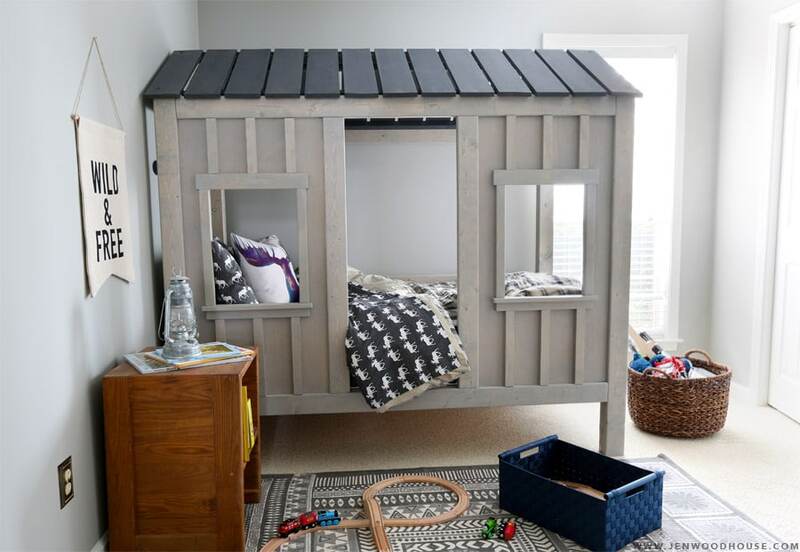 It also doesn’t stink like an oil-based finish can and since this bed was going into my son’s room, I didn’t want him breathing in all those stinky odors. Clean-up is a breeze too with a water-based poly – just a bit of soap and water and you’re good to go. What do you think? Super fun, right? Thanks for reading friends! I hope you found this tutorial useful. 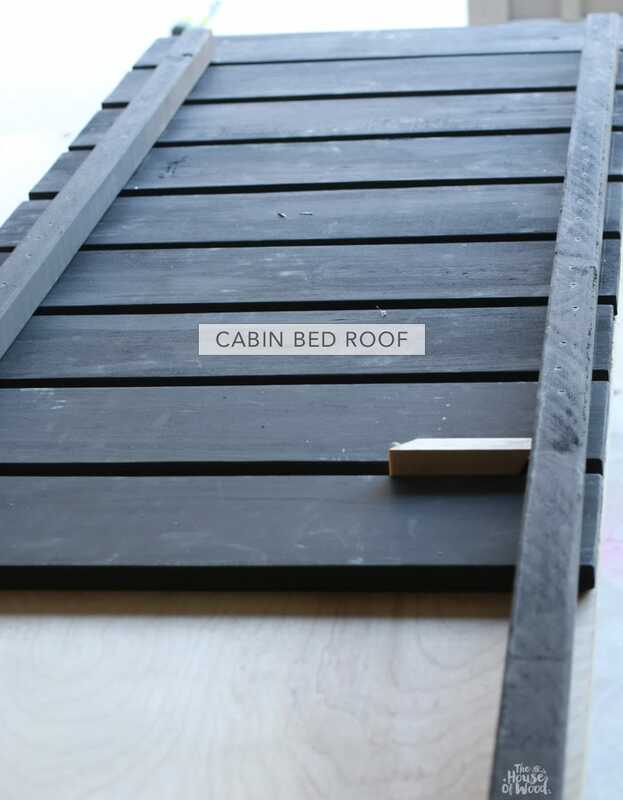 I’ve been checking out your DIY cabin beds on social media and it makes me so giddy seeing all of your versions. Keep sharing and tagging me @jenwoodhouse so I can see your building projects. Have a great rest of the week and get out there and build something this weekend! 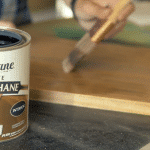 *A huge thank you to Rust-Oleum for sponsoring this post. All efforts, opinions, and happy dances are my own. Thank you so much for sharing! We can’t wait to build this bed for our son!! 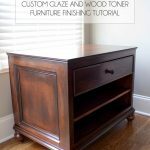 Love the finish you created with the stains! This bed is just so awesome!! Can you share what kind of mattress you have on this bed? We are planning to build it and seeing comments about not the standard size, I was wondering if you had a different size? Thanks! We have a twin size on this cabin bed. Sorry, I meant to ask, what brand? We have the Dream Bed twin mattress. Can you please tell me if I could purchase the twin cabin bed for a daughter from you? Or pay you to make it for us? Please!!! Where are you located? I might be able to find a local maker in your area. Thanks for reaching out! A new site called Pine+Main just launched – it’s a network of local makers and furniture builders. 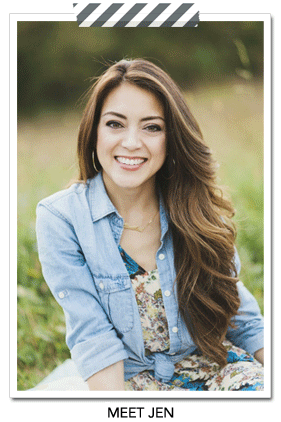 Check it out here: http://pineandmain.org Best of luck! hi there. could you share an estimate on how much it cost for you to purchase all the necessary materials? 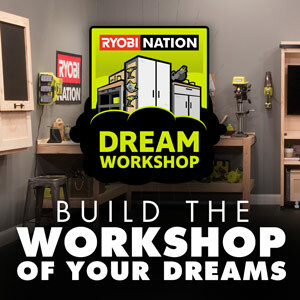 Just trying to get an idea of how much I would be saving by this DIY vs purchasing the RH one. THANKS & your son is so lucky to have such a handymom! Thanks Rebecca! 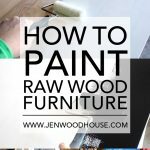 I mentioned it in the post – cost of materials was about $350 and RH sells theirs for almost $3000! Hope that helps! Did you stain the pieces before you put it all together? I see you said you did on the roof, but not on the bed. We got the supplies last night and I’m anxious to get going! Thanks for the tutorials! Yes, I stained and finished all four constructed pieces, then took the pieces inside to construct the cabin bed. Hope that makes sense? You’re welcome – can’t wait to see your version of my DIY cabin bed! Thanks so much for inspiring us to make this for our son. I was wondering what your recommendation was on one item: should we attach the batten to the panels then use the poly finish or apply the poly finish first then attach them? I attached the battens first and then applied the poly, but you could do it either way, really. It’s just a matter of preference. So glad to hear you built the cabin bed! I am in the middle of building this bed and I am just wondering if you ever made the ladder/step for it? I found another plan on Ana’s website that I can kind of use to go off of (it’s a loft bed with stairs) but I am just not 100% sure how it will work with this bed. Any advice would be greatly appreciated! As soon as I finish i will post pics on Ana’s site! I’m in the middle of making this bed. I just noticed that you stained the bed instead of painting it. What was your reasoning for doing that. I stained the bed and painted the roof slats. I chose to stain the bottom part because I wanted the wood grain to show through. how many cans of the 32 oz stain did you use ? one sun bleach and one weather gray ? also how many cans of chalk paint 30 oz did this take for roof ? Wow I don’t have children and I don’t think my husband would love this bed, but I want it! Thanks for tutorial.